Most of my photography is pretty straight stuff, but occasionally I delve into Photoshop a little deeper and create something for fun. If you’ve been following my blog you may remember my creations of little wooden mannequins in a pot on a stove, serving as a hot tub, while one of them turns on the burner, https://photographyunposed.wordpress.com/2011/06/17/just-having-fun/ . It’s called Turning on the Hot Tub. Here’s another little creation using my “woody people”. I shot “Woody” on a green screen and then placed him into this photo of a graffiti covered box car. I need to perfect that process a bit, you can see a little touch of green reflected on “Woody’s” body. Last week I finally got around to an image I had been envisioning for quite some time. 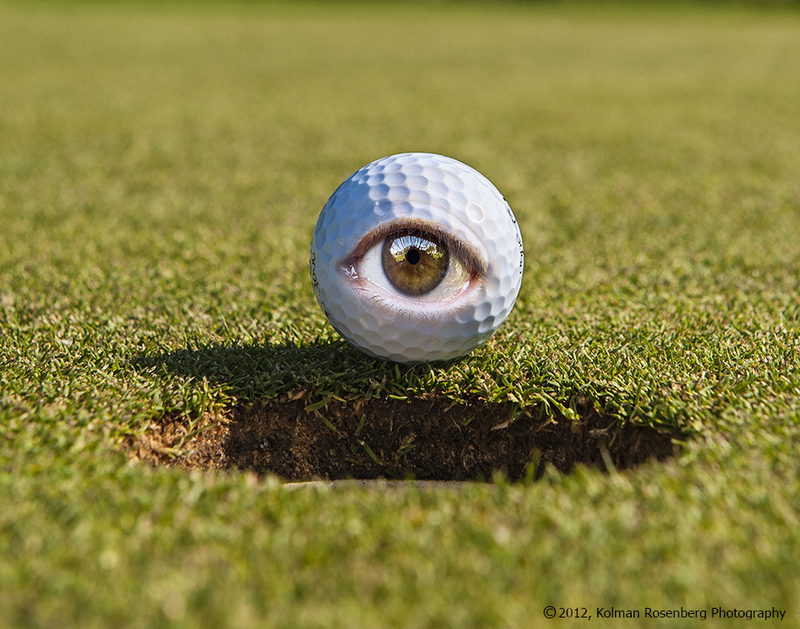 The new “seeing eye” golf ball. I took some photos of eyes and then a photo of the golf ball on the lip of the cup and combined them in Photoshop. I can see a whole series of these and will probably pursue that as a fun project. I’ve already been told this shot is creepy! I just think it’s funny! What do you think? This entry was posted in Uncategorized and tagged ball, boxcar, chromakey, composite, compositing, cup, Eye, eyeball, fun, Golf, graffiti, Green, green screen, lip, mannequin, Photo, photography, photoshop, Train, woody. Bookmark the permalink. LOL, yes Heidi, that was my initial title for the photo! Another friend suggested, Apple’s new iBall! Pretty slick Kolman…..knot what I’d normally expect from you; woody goes against the grain of your usual work. You are right Stu, but every once in awhile I decide to push myself to do some things with PS to learn something new or just have some fun!